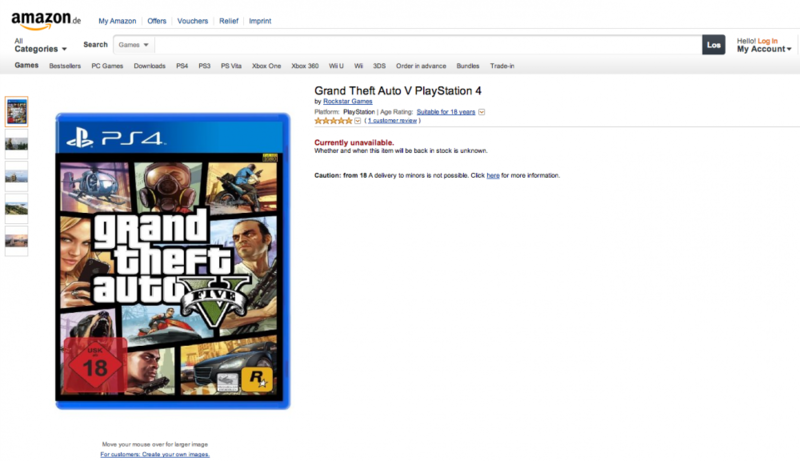 Rockstar hasn’t clarified if GTA V is coming to next-gen consoles, but with less than a week to go until the official release, Amazon.de has listed the game for the PS4. The listing has since been taken down and now redirects to a 404 page, but the screenshot below confirms the listing and shows the PS4 box art for the game. The listing could have been a mistake on Amazon’s part, or it could have accidentally leaked the listing before an official announcement from Rockstar. Hopefully, Rockstar confirm the existence of a next-gen version of the game soon (most likely after the current-gen version releases next week).